Welcome to the official first day of spring! 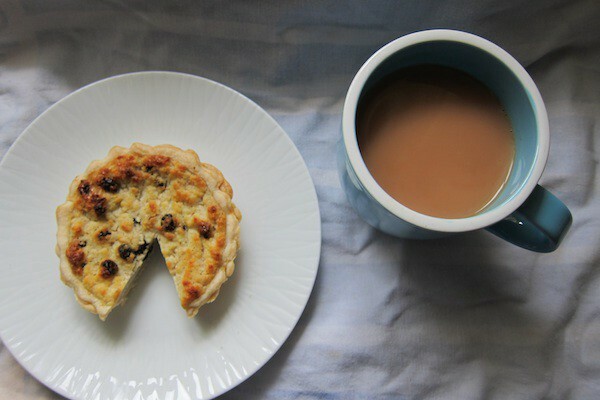 It’s time to make traditional Yorkshire curd tarts from the Northeast of England. Let us bake this regional treat, which dates back to the early 17th century, and remember the area’s most famous siblings: the Brontë sisters. Born and bred in West Yorkshire, it’s fair to assume that they ate a few curd tarts in their day. As March is also the perfect weather to roam the Yorkshire moors in the chilly wind and temperamental rain, it’s best to pair this baking adventure by channeling Emily Brontë and her masterpiece, Wuthering Heights. In the book, March 20 is also Cathy’s birthday (and the anniversary of her mother’s death) as well as the date when she meets Heathcliff and 15-year-old Linton. When you conjure up Emily Brontë’s voice, imagine her sounding similar to fellow Yorkshire lass Daisy from Downton Abbey. Aye, whot? It’s also likely that Mrs. Patmore would make these curd tarts for the Grantham family during teatime. Yorkshire curd tarts are still popular today, although only in Yorkshire. Elsewhere, this delicacy is virtually unknown. For years, this old version of baked cheesecake pastry has been overshadowed by the popular Yorkshire pudding. No more! Let’s get started. Take 12 quarts of Milk warm from the Cow, turn it with a good spoonfull of Runnet. Ideally, the milk would come from a Jersey cow (from the Channel Island off the coast of Normandy, France), a breed known for being kind, dainty, and producing milk high in butterfat. If you cannot find “milk warm” from a Jersey cow, substitute with 1.2 liters of full-fat milk from a local cow. Runnet, more commonly known as “rennet,” is a mammal stomach enzyme used to separate the curds from the whey. You can extract it from a calf’s fourth stomach chamber, but thankfully, this ingredient can be swapped for lemon juice, which is far more convenient and infinitely more pleasing. Heat the milk in a saucepan until it slowly simmers. Pour the lemon juice into the milk. Break it well, and put it in a large strainer, in which rowl it up and down, that all the Whey may run out into a little tub; when all that will is run out, wring out more. Then break the curds well; then wring it again, and more whey will come. Thus break and wring till no more come. As soon as the lemon juice meets the milk, the magic begins. It is also when you should take a spoon and “rowl it up and down.” Rowl with a big spoon, slowly stirring the milk and lemon juice and suddenly they will appear: beautiful, clumpy curds separating from the pale yellow whey. Delight in your curd success. Finally understand the Miss Muffet nursery rhyme. Lower the heat and stir gently to encourage curds to form (but do not stir too quickly lest you scare away the curds). Your kitchen will smell like cheese. Everything is going according to plan. Remove from heat and let the curds cool in the whey liquid. At this stage, kill time by walking along the wild Yorkshire moors as the Brontë sisters surely did while they waited for their own curds to cool. Feel the wind whip in your face. Marvel at the lavender and heather billowing in the wind. Your long dress will protect you from the stinging nettles. 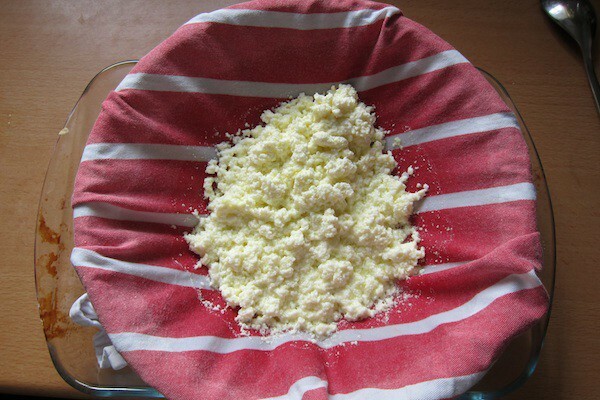 Once you’ve returned from your walk and taken off your bonnet, place a clean tea towel (dishcloth to us Americans) over a bowl and pour the curd mixture over the towel — this will sieve the curds from the whey. Leave overnight at room temperature (but refrigerate once the curds have separated). That evening, meet up with your sisters in your dining room and walk around the dining table discussing plots, characters and dramatic love affairs on desolate lands. Then, go to bed. And for God’s sake, close your windows. The next morning, begin the crust and filling. Blend ingredients until smooth (using only your hands and a spoon). When I asked a British observer for advice on how to remove the lumps, he recommended, “Vigor.” Roll out the dough and make a well — add cold water to make it smooth, but not sticky. Place in the refrigerator (if you’re in Yorkshire, just place outside). Cream the butter and the sugar with additional vigor. Slowly add the egg until the mixture is smooth. Add the spices. Then, go check on your curds. Gently whisk them into the mixture. Mix in the currants. Fetch the dough and roll it into your tartlet pans. Spoon the filling onto dough. Fire up the oven to 180° Celsius (400° Fahrenheit) and bake for 35 minutes. Learn German while you wait. The end result is a cheesy, golden Yorkshire curd tartlet. It’s like eating a lumpy, spicy baked cheesecake that has bares a slight resemblance to scrambled eggs with raisins and pastry. All things considered, it’s not bad and others will be in awe of your homemade cheese curds. It is the kind of tart that can nourish, impress and disgust. Serve warm, accompanied by a cup of tea. Do not go mad and starve yourself because you are despondent and longing for the Heathcliff in your life. Instead, eat the curd tart and be glad there is a cure for tuberculosis. Now go write the next great English classic. Jessica Pan and her friend Rachel wrote a book, Graduates in Wonderland (Gotham), an epistolary memoir about living in Beijing and Paris. It’s out in May and available now for pre-order. It also contains all of their intimate secrets. Find other general nonsense here.